Mydoum is located 65KM to the south of Sakkara. 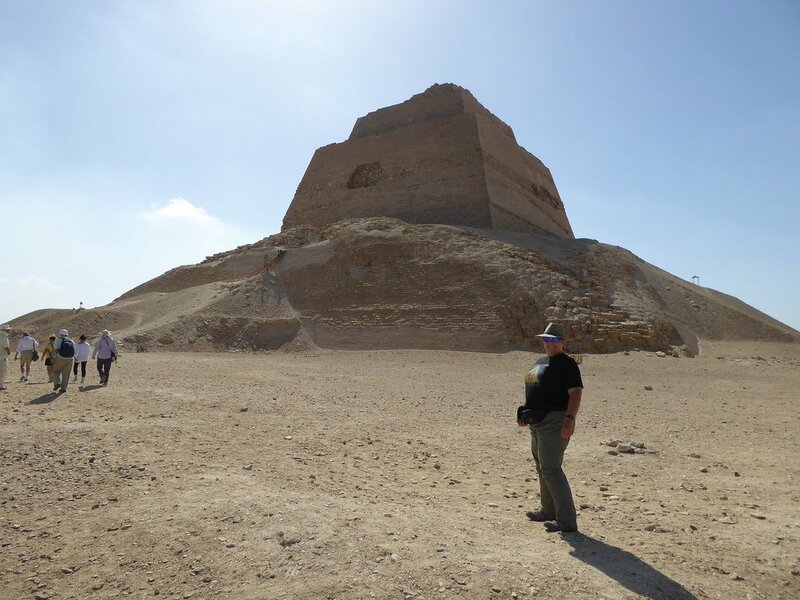 You simply drive along the road that takes you to Sakkara, past the site of Sakkara and drive straight for about an hour, or until you can see the pyramid. There is another way to reach Mydoum, it is longer but faster. You can drive on the Fayoum oasis road and then join the Asyout desert road, after about 77KM you can see the pyramid of Mydoum on your left side. There you have to pay an entrance ticket, it costs 16LE( 3$) and to use your camera you have to get a camera ticket that will cost you 5 LE (1$). I have noticed in the last few years that some travel agencies have been trying to organize trips to the pyramid of Mydoum together with the pyramid of Dahshour in a one-day trip. I just hope they keep doing this. In the last few years I have led special groups to that pyramid. Every time I go there I get overwhelmed with the place and the feeling that there still dozens of secrets in this site uncovered, I feel it never had the chance to have a proper investigation. I can simply call it a virgin site. The pyramid of Mydoum was built by the last king of the third dynasty king “HUNI” in the style of a step pyramid, it was originally 8 steps on top of each other. 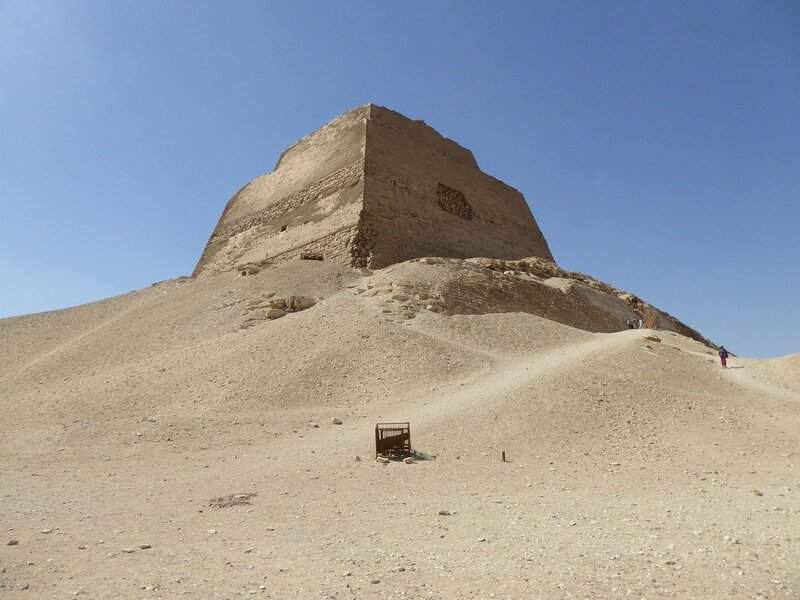 For a long time Egyptologists believed that the pyramid was built by King Senfru, the builder of the two pyramids in Dahshour, the belief came as we found some graffiti in the funerary temple located at the eastern side of the pyramid which had been discovered at the end of the 19th century. This graffiti on the eastern wall of the temple, was left by some ancient Egyptian travelers from the time of the 19th dynasty (1300 BC) recording their admiration of the great structure that King Senfru had built in Mydoum. As a matter of fact it seems that the last king of the third dynasty “Huni” left his pyramid unfinished and it seems that his successor King Senfru finished the building for him, so that latter generations thought it was the work of Senfru. It is hard today to believe that one king did actually have 3tombs built for him, the two pyramids in Dahshour, and a third one in Mydoum. Today it is strongly believed it had been the work of Huni in the first place and then completed by his son after his death. The pyramid is called today the collapsed pyramid as it looks from afar like a huge tower. The pyramid was 93 m high and built on square base that measures about 114 m long. The entrance of the pyramid is located almost 30 meters above the ground level in the northern side of the pyramid. It leads to a descending corridor that goes for 54m, it is unique among all the descending corridors in that you don’t have to bend down to enter it, unless you are really a tall person… Here you have to have a torch to light your way, as most of the lamps are broken (I have told the inspectors there several times to change them, but no one cared). At the end of the corridor you will find a small chamber roughly cut in the bed rock exactly underneath the apex line of the pyramid. And at the end of this room you will find a wooden ladder that leads up to the burial chamber. On your way up you will notice some huge beams of cedar wood that are 4600 years old. The burial chamber is very small if compared with other burial chambers found inside other pyramids. It has a corbelled roof that is not well done and the rest of the room is empty. In the midst of the 19th century a small wooden coffin was found here and later on it was taken to the Egyptian Museum. In 2001 a French team of Egyptologists found a small corridor at the end of the wooden ladder that takes you up to the burial chamber, it is about 3 meters long. This discovery has not been released to the public yet. In front of the northern side of the pyramid about 300 meters to the north there is a set up of tombs built in the time of the fourth dynasty and found in 1855. These tombs yielded great treasure to the Egyptian Museum. There you will find the tomb of Ra-Hotep and his wife Nofert. Here we found two beautiful limestone statues of them still in perfect condition and they are among the most famous master pieces in the Cairo Museum today. RA- HOTEP was the son of King Senfru and the commander of the Egyptian army in the 4th dynasty a chief priest of center of the worship of god RA the sun god. Nearby the tomb of RA- HOTEP, another one was found, the great tombs of Nefer-Matt. There we found some great paintings considered the best and the oldest ever found in a tomb, exhibited in the Egyptian Museum in the same room as you will see the statues of Ra hotep and his wife. The most famous is what we call the scene of the geese of Mydoum. It is a beautiful scene of the 6 Egyptian geese together made on a mud brick wall that was covered with a coat of stucco and painted. It is one the greatest master pieces of the Egyptian museum. To the east of the pyramid, there is another set of tombs dating back to the 4th dynasty. One of them is a tomb for an unknown person that was found with no inscription at all. I love this tomb; to go inside is a real adventure! The entrance that you use to get inside was actually made by the tomb robbers. I usually take my groups there but first I always make sure that they are fit to do it, as it is tiring but worth the visit. The entrance of the tombs leads through a descending corridor that is about 10 m long then you will find a small shaft inside of which there is a modern wooden ladder that takes you down to another tunnel, at the end of which you will find a hole in the wall, like the needle hole, you can’t get through so easily, you will have to crawl on your stomach. Yes, you will have to do the same way ancient tombs robbers once did it. Then you will find a larger passage way and huge blocks of limestone, midway across this tunnel you will find the entrance to the burial chamber, it is so impressive, so elegant, all of limestone. At the end of the chamber there is a huge granite sarcophagus with the lid slightly set opened. It was plundered by tomb robbers thousands of years ago. The mummy was never found, most probably it was taken by the robbers. There underneath the lid, you will notice a small ancient hammer stuck underneath the heavy led, forgotten by the ancient tomb robbers. It is great to see and touch, to put your hand on the handle of something that is thousands of years old. It is the highlight of the visit. And yes when you are finished, to get out of the tomb, you have to use the same way as you did to get in!!! In front of the eastern side of the pyramid you will find a small funerary temple that is still intact. When you enter the temple, notice that in front of the door at the western wall you can see the black graffiti that was left by the travelers from the 19th dynasty who came there and recorded their visit. The temple has no paintings or inscriptions. In front of the temple you can see the causeway that traditionally led to the mummification temple located at the end of the causeway. Unfortunately the mummification temple has been destroyed and nothing left of it..